Grand Hotel Excelsior Vittoria, Italy 5.0 out of 5 based on ratings. 1 user reviews. The Hotel dates back to 1834, a time when Italy was not yet a unified country. From the day it opened the establishment has been owned and run by the Fiorentino family, one of the few founding hotelier families remaining in Italy today. The long history of the EXCELSIOR VITTORIA is reflected in the unique fin-de-siecle style of the building, which still retains its period of splendor. The interiors are tastefully decorated and contain original antique furniture including beautiful pieces crafted locally, featuring inlaid decoration. 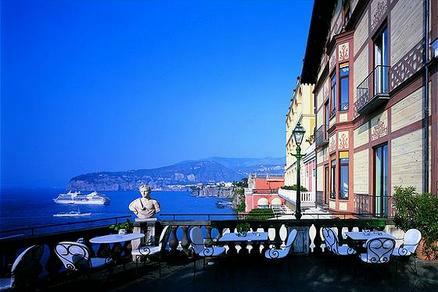 The Hotel and its terraces, famous for their breathtaking views over the Bay of Naples, have played host to many celebrities and discerning travelers including kings and queens, artists (Richard Wagner, Enrico Caruso, Jack Lemmon, Marilyn Monroe, Sophia Loren) and other notable personalities attracted to Sorrento and the surrounding area. Five acres of private garden with citrus and olive trees also contribute to make the EXCELSIOR VITTORIA a unique hotel. There is a large swimming pool in the grounds, with an orange grove nearby, where guests can bathe and relax in the Mediterranean sun.